Before today’s game, Utah Jazz head coach Quin Snyder paid the highest compliment to the backcourt they were about to contend with on Sunday, calling the Washington Wizards’ duo of John Wall and Bradley Beal the best backcourt in the NBA. 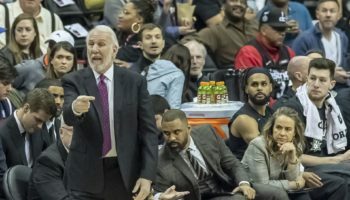 Whether he meant it as a subtle way of motivating his players or not, a couple of perimeter-oriented players on Snyder’s team stole the show and upstaged the more ballyhooed backcourt. All-Star swingman Gordon Hayward scored 30 points and point guard George Hill chipped in with 21 points and six assists as the Utah Jazz handed the Washington Wizards a rare home loss, a 102-92 victory for the Jazz that was even more convincing than the final margin indicated. At one point in the third quarter, Utah had a 70-46 lead, completely taking the Wizards out of their transition game and doing to them what the Wizards usually do to most of their opponents at home: get an early jump then suffocate their opponent the rest of the way. 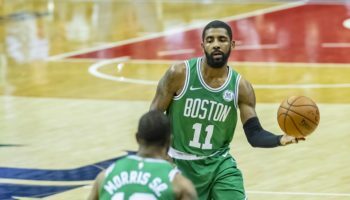 The last time these two teams played, on Jan. 11, Wall and Celtics forward Jae Crowder got into a scuffle that caused the players to be separated and them both of them receiving fines from the league. Last season, Boston guard Marcus Smart hit Beal in the face, resulting in a broken nose and a concussion. 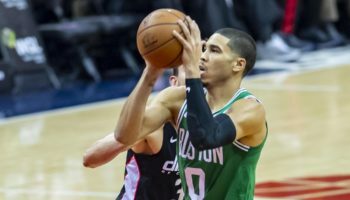 Those flashpoints, along with the close proximity of these teams in geographic location and near the top of the Eastern Conference standings, made this one of the most anticipated games of the NBA season so far. Though Wall and Beal combined for 25 points, the latter was scoreless in the first half after picking up three fouls. In that time, Utah took advantage and built a 10-point lead at the break after outscoring the Wizards 25-15 in the second quarter. While the Jazz didn’t have that much trouble making shots (46.6% FG today), their biggest problem came in actually keeping possession of the ball, as they committed 24 turnovers. In stepped another duo for the Jazz to offset the ball-handling carelessness. Center Rudy Gobert and power forward Derrick Favors combined to grab 27 rebounds, the same number that the Wizards grabbed as a team. Gobert ended the night with 20 rebounds, with both he and Favors grabbing four offensive rebounds each. Both of them also had four blocked shots. For the Wizards, this marked only the second home loss in the team’s last 21 games at the Verizon Center. During this run at home, Washington is used to getting out to big leads, enforcing its will in the paint early with Marcin Gortat inside and drives to the basket from Wall and Beal and kicking out to deadly three-point shooters like Otto Porter, Jr. Utah never let the Wizards get comfortable in the first half, and their physical brand of defense spread into the third quarter where they built their big lead. With just over three minutes to go, Washington had cut the lead down to eight, and then six, but then Hayward took over. 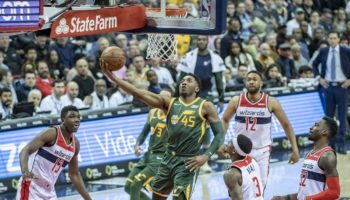 His offensive rebound and putback of a Hill missed three-pointer gave the Jazz a 95-85 lead and then, after Washington had cut the lead 95-89, Hayward hit a step-back three for a nine-point lead with 1:44 remaining. He followed with another jumper, from just inside the arc, on the next possession to put the game on ice. Hill also came up with big shots during the game, as he’s on pace to average the most points that he’s ever averaged in a season (17.6). After the challenge of facing each other, both teams will have another tough game waiting for them. Utah goes to Oklahoma City to take on arguably the best guard in the league, Russell Westbrook and the Oklahoma City Thunder. 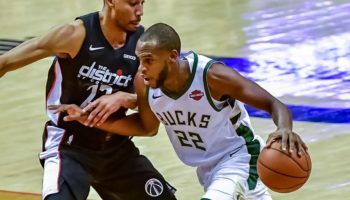 Washington stays home, but has to contend with what probably is the best backcourt – and team – in the NBA, the Golden State Warriors, on Tuesday night.